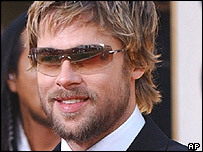 Hollywood actor Brad Pitt is to present a show on cult singer-songwriter Nick Drake on BBC Radio 2 next month. The documentary will be broadcast on 22 May at 2100 BST. Pitt was asked to host the show after Radio 2 learned he was a Drake fan. Drake, who died aged 26 in 1974, is regarded as one of the most influential acoustic songwriters in British music. "I was introduced to Nick Drake's music about five years ago, and am a huge admirer of his records," said Pitt. "I was delighted to be asked and pleased that I was able to fit it into my schedule." Lost Boy - In Search Of Nick Drake tells the life story of the celebrated singer, who has influenced many musicians including Norah Jones and REM. The programme includes Norah Jones's cover of Drake's song Day is Done, recorded in 2001, as well as the airing of a previously 'lost' track, Tow the Line, for the first time. The track was found during work on a new record of Drake's rare or unreleased work. Lesley Douglas, Controller BBC Radio 2 & 6 Music says: "I am thrilled to welcome Brad Pitt to Radio 2 to present what promises to be a unique and unmissable profile of the life and music of Nick Drake. "Drake is regularly cited as an influence by some of Radio 2's core artists, including REM, Paul Weller and Badly Drawn Boy and to have a genuine fan like Brad Pitt to present the programme will make it a compelling listen."